Delicious Japanese tapas. So, the real question is…why didn’t I go here sooner? Why did no one tell me about this place? It’s friendly, loud, and oh so freakin’ good! Is it cheap? NO. But, I did get happily filled for $25. Decent, very decent. Zakkushi’s focus is most certainly robata. 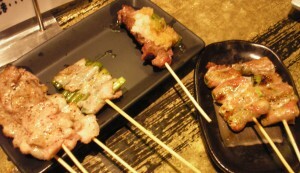 We ordered a fair number of items ranging from chicken, pork, and beef to asparagus tsukune. 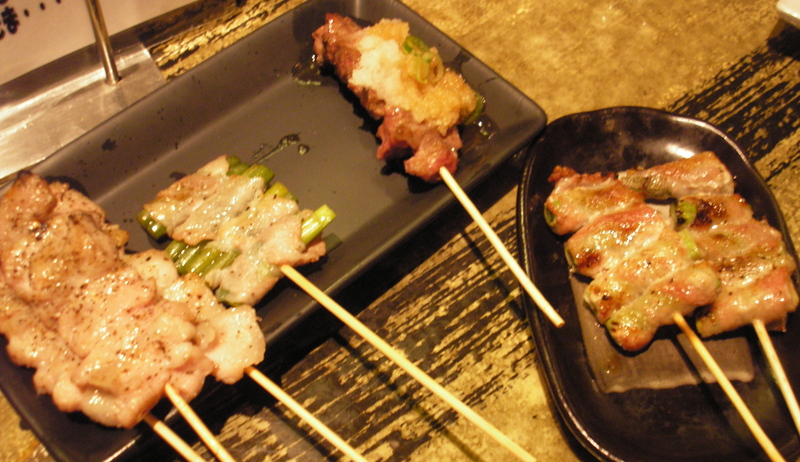 The tsukune come with a variety of toppings ranging from cheese or seaweed to daikon and sesame. I was a little intimidated by some of the options which include quail egg and chicken heart — but for under $2 most everything is worth a try. Why? Because it’s all so deeeeeeelicious! Why didn’t I ever think of wrapping my asparagus in bacon? 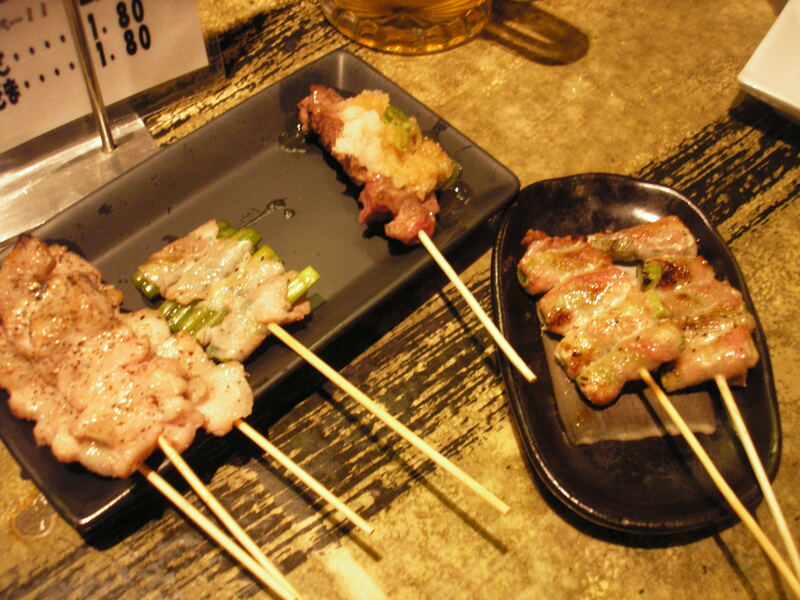 The meats are tender and tasty, plus, eating things on a skewer is always fun. We also tried the beef stew — which is a surprisingly light broth given how much flavor is packed into it and the hunks of beef just melt in your mouth! The next dish we sampled was a batter fried ebi served with a tasty chili mayo. Yummers! 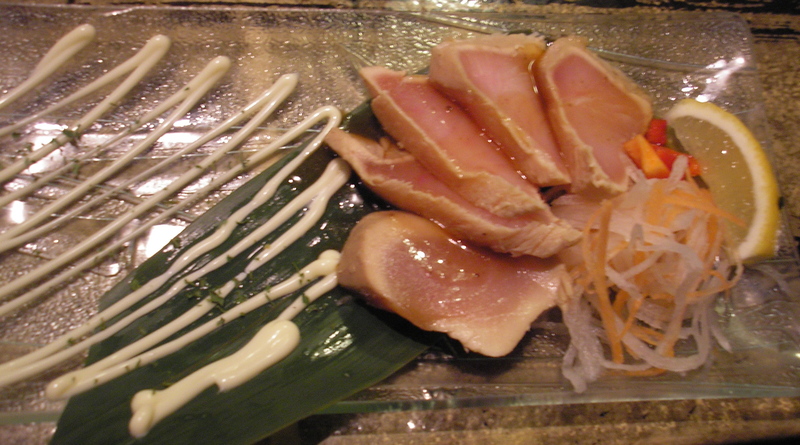 By the time the tuna sashimi arrived I felt like I might be in food heaven — it was very lightly seared…and, tuna sashimi may very well be the reason I fell in love with Japanese cuisine in the first place. So, not a single complaint could be brought against this dish on my blog. We finished off the savory dishes with a pork udon. Which was….udon. Neither here nor there. Then I convinced my dinning partner that there was no way to pass up a dessert of $3 banana gyoza. C’mon, deep fried banana and ice cream — how can you go wrong? It was so very worth every penny. I curse myself for not having gone to Zakkushi sooner. I am currently working on convincing my husband we should go back tomorrow night. Hurrah for Zakkushi!! Additional locations at 1833 West 4th and at 4075 Main St. This homage to Alberta is delightfully pretty. Yay for indie rock with a folksy twist. Hopefully this young band will flourish….okay, what does this album have to do with robata? Not a damn thing, and I don’t care. 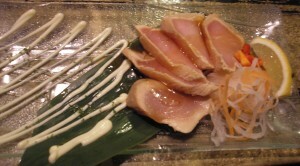 This entry was posted in Food, Music, Restaurant Reviews and tagged japanese, robata, tapas, Vancouver, west end. Bookmark the permalink.